Apparently this week is summer in Glasgow! We sometimes only get what feels like a few days of sun so we have been making to most of it. Yesterday Rockin' Roy and I went to Pollok Country Park and the Burrell Collection. Magic! And if you're not the rambling kind you can enjoy this safe in the knowledge there are toilets and a café near by! The Burrell Collection contains all kinds of art and historical objects. There are pieces by Rodin, Cezanne and Degas and the famous Warwick Vase. I love the building as much as the art because it has lots of wooden beams and stained glass inside and tall windows facing the woodland. Today the weather was again in our favour so we headed into town to the Glasgow Green, the oldest part of the city. King James II granted the land to Bishop William Turnbull and the people of Glasgow in 1450 but it was a good few centuries before it became a 'park' as we would recognise today. It's full of landmarks and history. The People's Palace is a museum and glasshouse (aka the Winter Gardens) which opened in 1898. There is a botanical display of plants, a café and a museum of social history. According to Wiki, at the opening ceremony Lord Rosebery stated: "A palace of pleasure and imagination around which the people may place their affections and which may give them a home on which their memory may rest". He declared the building: "Open to the people for ever and ever". Currently in the People's Palace there is an exhibition on about the iconic Glasgow Red Road Flats which are in the process of being demolished and were previously home to thousands of people. Next to Glasgow Green is the WEST Brewery. We wanted to go here for a pint but sadly we are too poor this week! We have been taking picnics with us all week and not spending any money during this holiday. We will visit the bar at some point in the future as WEST has been highly recommended to us by friends. The WEST Brewery is located inside the old Templeton Building where they make a range of beers in strict accordance with the old German purity law, 1516 Reinheitsgebot, meaning they are free from chemicals and safe for vegans. After the park we took a wander up to Glasgow's 'City of the Dead' - the Necropolis! Around 50,000 individuals have been buried in the Victorian cemetery which sits on a high hill in the East of Glasgow. There are many ornate memorial sites here and it gives an excellent vantage point to view the city from. Visiting such a place could seem spooky or morbid but death is a part of life and visiting any grave site is a good way to gather perspective and remind yourself to be a little kinder. I like spooky stuff but I did not see any... except for this angel holding a flower... don't blink! I took some inspiration from old psychedelic and retro b-movie posters. And this is what the Little Hands of Silver sound like...I filmed this - which means I stood really still with a camera. This is a view from Brodick on the Isle of Arran, which we visited on my birthday in March. I'd really like to go back to Arran during some clear weather and get stuck into some proper landscape painting. The above two are acrylics this one is of Rockin' Roy from a photo on the day our wedding last year done in oil paint. I find drawing and painting people much easier than landscapes and still life which, at least in my experience, is the opposite of most people. I love painting and harbour dreams about doing arty stuff for a living but it doesn't seem to be on the cards at the moment. If anyone out there would like me to do a painting/craft project - feel free to give me a shout! One of my sisters is actually a proper professional artist - Debbie Lord Fused Glass. This is her work below! You can buy her work through various galleries around the country, on her website and through her Facebook page. My younger sister is another artistic soul and a photographer - Eleanor DC is part of the team responsible for the Carlisle Photo Festival and currently has an exhibition on at the Tyneside Cinema in Newcastle and another exhibition coming up in Carlisle in June. The arty thing is in the genes it would seem. I am hoping to visit a few exhibitions in the next week in Glasgow so will blog about them soon. Tomorrow night I will be going to see a new local band called Woodwife at Broadcast supporting Miss Lucid who are launching an EP. I've not heard Miss Lucid or the other supporting bands play before so it will be fun to see some new bands. This will be Woodwife's second ever gig and while they don't have any recordings up online yet they are already creating a bit of a buzz so keep an ear out for them! I caught their first gig and they are great live. Apologies Racy readers for being absent from the Racy blogging scene. Some of the time away was the result of a bad chest infection which meant what energy I had was redirected to other important life stuff for several weeks. It also meant I've not been out and about as much seeing cool retro vintage stuff. This means today's blog will be a bit of mid season break where I just kind of list a bunch of cool vintage themed stuff. Enjoy! Amazing nail art - a list of 26 gorgeous Gatsby themed nail styles. I've never had the patience to try this sort of thing but these images do make me want to give it a go. 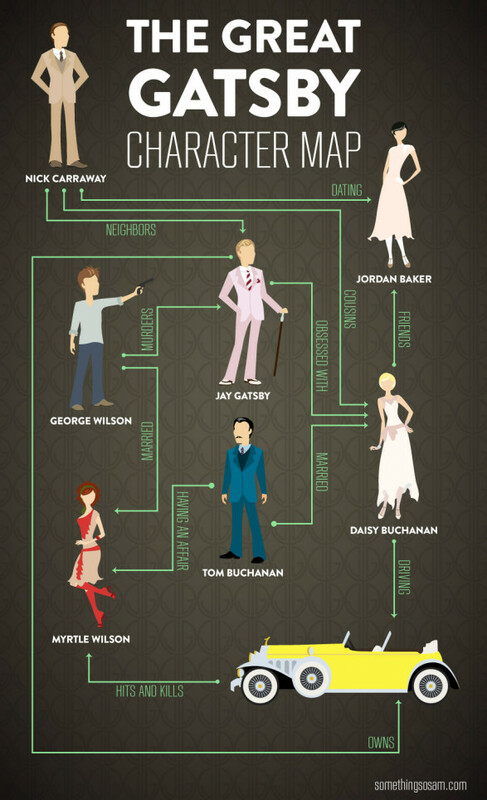 A great infographic on how much it would cost to be Gatsby - more or less than you would expect? The wonderful Glasgow Gatsby Club returns to town soon, the next date has been confirmed as Saturday 8 June at the Glasgow University Union. I'd recommend following them on Facebook as they seem most active on there. I've written before about the fun I had at March's Gatsby night and I really hope to go again this time but I've feeling tickets may sell out before I am able to get one! Check out the lavish sets for the Gatsby film here on Architectural Digest. If you like something a little more permanent than nail polish how about a Gatsby tattoo? And here's a video explaining the plot of the Great Gatsby in less than two minutes - obviously, HEAVY SPOILERS, obviously. Even if you don't feel Gatsby is a 'great American classic' if you like 1920's period style then there will likely be something for you within the cadre of adaptations. I don't think I would have cast Carey Mulligan in the latest movie, though I do think she is a great actress, as I don't tend to put her in the dazzled-by-glitz-daisy category but I will have to see the film to find out how she plays it! I am keen to see Leonardo DiCaprio in the role of Jay Gatsby but I wouldn't cast Toby Maguire in anything. Well to finish off this post - enjoy the swingingest dancer I have ever seen, accompanying Serge Gainsbourg.